I finally gave up and decided to buy a new unit and use this one for spare parts (the picture above shows its current state). Wise decision, I eventually scavenged enough parts that there's not much left except the main body (and there are broken bits from the frame - go figure). I'm still happy about this heli, it got me started and trained me up to the point of being able to hover for at least 30 seconds. Another great thing about this heli is that it's relatively easy to work on. The only tools you need are a 1.5mm hex key (I use a ball driver, a screw driver handle with a hex shaft), a very small phillips screwdriver, and teeny tiny fingers (long nose pliers are an alternative). Unscrew the main blade linkages from the swashplate. Be careful when screwing the linkages back into the swashplate, if you get the screw even slightly cross threaded you can wind up breaking the screw head off - don't do that. Unscrew the collar on the main shaft. The collar is just below the top bearing which is in the frame just below the swashplate. Remove the screw that goes through the main bearing and the main shaft. Remove the main shaft. You should now be able to hold the main gear steady while you pull the main shaft out while simultaneously twisting the main shaft back and forth slightly. It's a tight fit but the shaft will eventually pull out, freeing up the main gear. Put in the new main gear and reverse the above steps to install it. One problem is that you have to precisely line up the hole in the gear with the hole in the main shaft so that you can put the screw through. Fiddle with it and eventually you'll get it right. 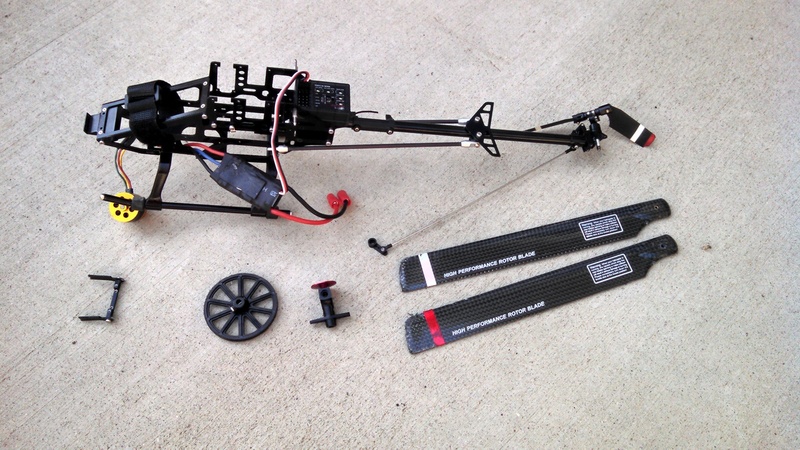 Power on the heli, move the swashplate to the top of the main shaft, power off the heli. This will give you room to work on the next steps. Remove the clip that bundles the servo wires together on the side of the frame. You'll need play in the wires to work on the servos. Remove the screw that secures the horn to the servo and pull the horn off. Remove the six screws that hold this plate to the frame and remove the seventh screw that holds the top of the elevator servo. Now you should be able to lift the plate up enough to clear the frame and still have space to twist it around the main shaft. Twist the plate one way or the other to free the servo and replace it. Do everything in reverse to secure the new servo. One problem you need to address is replacing the horn on the new servo properly. Before I re-attach the horn I power on the heli and use the collective control to again move the swashplate to the top of the shaft (it'll be tilted because you haven't attached the horn to the new servo yet) and power off. Now attach the horn to the new servo and position the horn such that the swashplate is level, that should align the new servo properly. The elvevator servo is simple. Remove the horn, remove the two screws that hold the servo to the frame, and replace the servo. When re-attaching the horn you need to do the same technique as above (power on, swashplate to the top, power off, positon horn so swashplate is level) to make sure the horn is positioned properly. Remove the main gear. You should be an expert at this by now. Remove the electric motor. It's only held on by two screws, remove them and drop it out. Remove the metal plate that holds the tail gear. Remove the screws from the side of the frame to free up this plate. With a little bit of futzing you should be able to twist the plate and pull it out through the front of the frame. The gear itself is not screwed on to its shaft. You have to unscrew the collar from the bottom of the shaft so that you can remove the shaft from the plate. Then you can push the gear down, exposing the teeny rod the goes through the shaft. Just pull that rod out and the gear will now come off. As always, just do those steps in reverse to put things back together.